For our tour last year, we chose to ride two very different machines. Dgym bought his Ice QNT recumbent trike especially for the occasion. He wanted something more comfortable than an upright bike and, already owning a recumbent bike and not being quite happy with it, decided to add a wheel for stability (i.e. the ability to stop and have a rest when going up long hills). The largest chainring has been replaced with a larger one to compensate for the small wheels, giving us both a similar gear range, and all three of the tyres have been replaced as the original ones were a bit flimsy. Dawes Galaxy, which I've had for a few years, and has received various improvements, for example a homebuilt front wheel around the legendary SON hub dynamo which powers a Lumotec Oval front light (non-LED version), an extra-strong hand-built back wheel, and various other bits such as PD-M324 pedals and Body Geometry bar tape for extra comfort. We both had moments when the other's mode of transport seemed like a better option. Dgym was very happy on his trike and recieved a lot of admiring gazes, cheering and requests to photograph his beautiful machine. 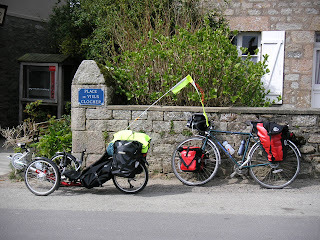 He was very much at an advantage when we came to a stop - my heavily loaded bike would swing around all over the place when handled, and had to be propped up against a wall, whereas obviously a trike has no such problem. Dgym always had a seat with him, which was handy for roadside lunches, and he even dozed off on it a couple of times (whilst stationary of course). Windy flat bits (e.g. the plains of Northern Europe) were a big advantage for dgym too, being lower to the ground and offering less air resistance, he breezed along whilst I struggled behind through thick treacle. I also got quite saddle sore in the flat areas, thanks to lack of variety in riding position, again not a problem for a recumbent rider. It's not all good news for the trike though. It's harder to lock up, you have to get the central cross-bar right up against a tree, lamp post, etc. and then there's no 'loop' in the frame so it's not as effective as locking a diamond-framed bike. On the occasions we were allowed to bring the bikes up to our hotel room, the trike was much, much harder to get up through stairwells (although we both suffered that one!). It's harder to take a trike on a train, we did manage, but it had to be disassembled in Denmark and attracted a lot of grumbles in the UK . There were no problems with any of the ferries we used. Then there were the various obstacles making it harder to use the trike. The frame of the trike is quite low, and it's easy to scrape it on humps on the road, e.g. for traffic calming. After being caught out by this once, dgym now gets off and gently lifts his trike over these bumps. In the Netherlands we also encountered many wooden fences / gates on the bike paths, obviously designed with regular bikes in mind but not having paid too much consideration to dgym and his beast. It was occasionally necessary to remove panniers from the trike and lift it over. I was at a higher vantage point in my saddle, so got to see more, whereas dgym often felt that he was looking up at the hedgerows and missing out on scenery. And I still feel that the bike's a better climber, although I may not be able to stop and sit down for a rest so easily. Dgym attracts a lot of comments about the height of his trike and how vulnerable he looks down there. It is fairly low, however you'll see that he has a tall fluorescent flag adorned with shiny ribbons. That helps. It also helps that recumbents are highly unusual and get noticed more - motorists will often get very cautious and give the trike a very wide berth. He also has the advantage that's virtually impossible to fall off. For now, we'll probably stick with what we've got. Dgym's still very pleased with his trike (although he doesn't spend enough time with her) and in a couple of weeks time we will be taking her to visit her homeland of Cornwall. Although I'm recumbent-curious and will probably get one when I have loads of money, I'm still comfortable on my Galaxy, it offers enough practical advantages, does everything a bike should do and will probably last a very long time.